Anna and Amaia's blog: Cooking is good fun! Today Dad and I cooked dinner together. Dad cut up a onion and started a fire under a pan and put on the onion, and he then gave me a piece of wood so that I could stir it. It was good fun, although I burned myself twice. I cried a bit and Dad put my hand under running cold water, and he then wanted to put me on the floor, but I cried again until he realised that I was not going to stop cooking just because of a wee burn. When the onions were done, Dad took them away and I started to cry again, until he gave me the empty pan back. 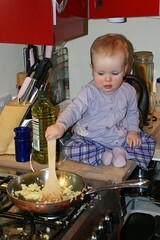 Cooking is good fun, it's just a shame Dad won't let me be in charge!